Guest post by Jordi — thank you! Think about a time you worked hard on something… it could be a test for which you studied hard and earned an A, it could be the day you received your acceptance letter from college or graduate school, it could be the day you got your first job offer… as you reflect upon these moments, think about what you did… I am sure the first thing that you wanted to do was call your close friend, parent, significant other, etc. and share the good news! Right? It is human desire to want to share good news and invite others to celebrate our hard work and achievements! Why should we not do the same for our students? As a teacher, it is our job to celebrate our students’ hard work and teach them to embrace their efforts and share them with others. We need to teach our students to be proud of what they accomplished. Celebrations give students time to reflect on the work that they have been doing and think about how far they have come. Celebrations can also be a learning opportunity, where students can look to their peers for new ideas. If we continuously teach without validating and celebrating our efforts, then we might lose the motivation to continue to work hard and improve. Frank Thomas’ Kindergarten classroom at PS 29 BK is all ready for a writing celebration! Notice the reader’s comment card (and the daisies!). It only takes a little effort to make it extra special! The way that people communicate with one another – both personally and professionally– has changed dramatically in the last few years. The way that teachers are communicating with parents and families is also changing very quickly. Many teachers give out their cell phone number to remain in a more direct line of communication with parents and families. Some feel it is great, and others feel it is overwhelming or too much! Do you ever wish that there were a way you could communicate with parents in a very direct way without giving out your personal cell phone number? What about if you could turn off messages and calls from parents on the weekend? Do you ever think to yourself after hanging up with a parent, “I really wish I had a transcript of that conversation…”? Registration for continuing students taking summer and fall courses opened today. Please contact Ellen to get approvals for your PROGRAM courses. You will need to send along your TC ID, that 8-digit number beginning with T. Most out-of-programs do not require approval or you will need to obtain it from the professor, but it’s a good idea to get an endorsement of these to make sure they qualify. Registration for new students begins May 18. We have been working to make our Teacher Certification Moodle site more user friendly and are happy to announce that our new and improved Moodle site is now live! Certification information and support regarding the edTPA and other state exams. A Glossary of Resources that include information on academic language, video recording, lesson templates, differentiation, FAQ’s and much more! Please take a moment to navigate through the new Moodle and look at the resources available! 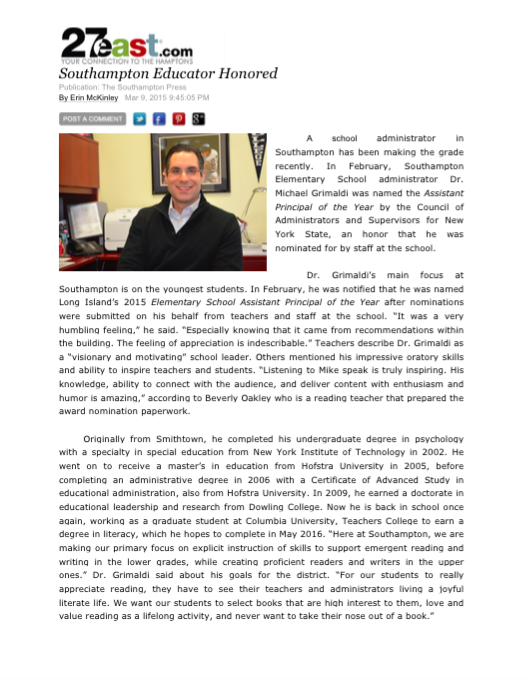 We are so proud of our very own Michael Grimaldi! Mike was named the Assistant Principal of the Year by the Council of Administrators and Supervisors for NY State. His school faculty and staff nominated him. As you can read here, his learning has been nonstop! Enjoy this guest post by Cara, a LITI student and full-time PK teacher. It reminds us how reading and writing begin with oral storytelling. Thanks, Cara! 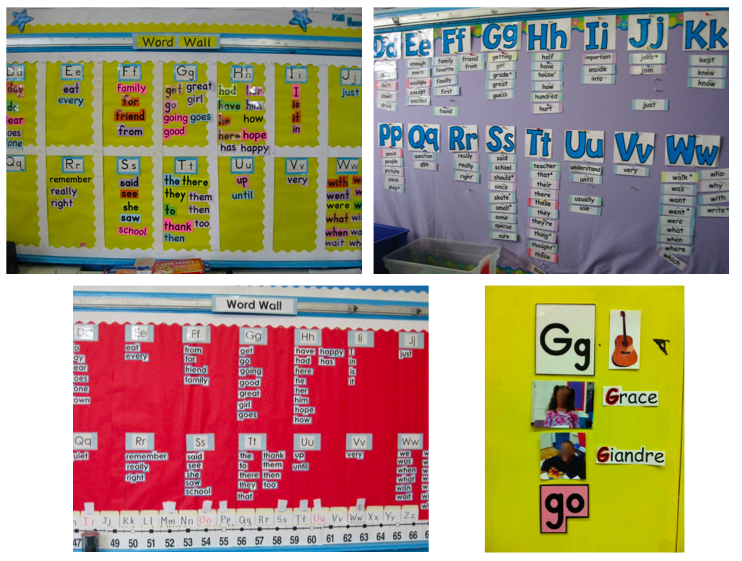 There are many worthwhile learning activities that take place in any preschool classroom. Every day, I plan mini lessons, games, and centers that will help prepare my 3- and 4-year-olds for kindergarten. One of the biggest challenges is building children’s early literacy skills. Some of my students are reading pattern books and others have minimal letter recognition. Some of my students can answer inferential questions about the way a character might be feeling, while others struggle to retell what happened on any given page. The most helpful classroom tool I have yet to find is a simple deck of “Tell Me a Story” cards. What makes these word walls great? They include selected common words – those high frequency and often hard to spell ones. They evolve. Well-known words come down and new ones are added. The words are easily visible, clearly organized, and boldly presented. The words are practiced, chanted, written, read. The students are held accountable for correct spelling of these words. There’s a big difference in merely having a word wall and doing a word wall!